Identifor is hosting a live Twitter chat about autism this week and we’d love to have you join us! The popularity of our last twitter chat means we already have another one ready for Thursday at 7pm est/ 4pm pst. We’re expecting a lively discussion amongst people from all walks of life — doctors, medical professionals, those with autism, those on the spectrum, friends and family of those with autism, and the list goes on. As part of our extended Identifor family, yes you, we’d love to see your face alongside our hashtag #AutismChat on Thursday at 7pm est / 4pm pst. If you’ve never done something before, it helps to know what kind of benefits you can expect from it. Why should you attend? Frankly, it wouldn’t be much of a chat if you didn’t join us, now would it? 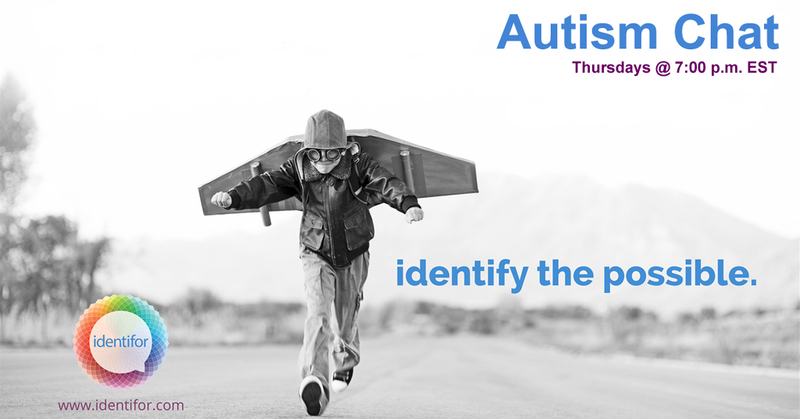 Humor aside, a Twitter chat about autism is an opportunity for you to connect with other like-minded people and discuss topics surrounding autism that are important to them. Our goal is to create a community of people touched by autism. We typically begin each chat with a list of 8 topics. One by one, we take our time discussing the topics while appending the hashtag #AutismChat at the end of the tweets. You can easily keep up with the conversation even if you’re not following everyone by using a website that’s designed for Twitter chats. We recommend www.tweetchat.com. Simply go to that site, enter the hashtag, and click “Yes” when the prompt comes up asking you to authorize your Twitter account. Then you’ll be able to actively participate in the conversation, and maybe make some new friends and connections along the way. If you weren’t able to make it to last week’s Autism Chat, you can catch up on what you missed here and get a feel for what to expect in this week’s. Q1. What have you done to understand your child’s issues and abilities? Q2. Have you received an Individualized Education Plan, or IEP, for your child? Q3. If so, how much did the IEP help you to help your child? Q4. Have you sent an email/letter to your child’s teacher outlining your child’s strengths? Q5. What have you done to build a support system so that you are calm in front of your child? Q6. Have you considered keeping a binder for any bullying/teasing issues that arise with your child? Q7. How do you keep up with new services available to your child? Q8. Have you ever considered being an advocate for special-needs children? Please keep in mind, especially if you’re new to Twitter chats, that when you’re responding to a specific question it works best if you preface your tweets with A1, A2, A3, etc. Again, Autism Chat occurs each week on Thursday at 7pm est/ 4pm pst. We look forward to having you join us. If there’s a topic you want to discuss that you don’t see listed, please let us know and we’d be happy to look into using it in future Autism Chats.